Since 2015 Tom Martin has been working on sculptural pieces, alongside his paintings - continuing with his current exploration of money. 'The Time is Now' and 'The Time is Now II' take their inspiration from his paintings - still lifes of vases at the point of breakage. In these sculptures, they are suspended literally and metaphorically with the use of resin to seemingly hold them in mid-flight. Throughout his practice, Martin has always sought out new and interesting ways to convey his ideas. Whilst the sculptures are a lot quicker to make than his paintings, there is no room for mistakes and Martin must work continuously on them until they are finished. They are fascinating, eye-catching works, and we wanted to explore them a little closer. Each piece takes Martin around 40 hours to make and he must work continuously on it from start to finish. Martin begins by making what will be frozen in the resin; he sources the vases at local charity shops, breaks them and then carefully reassemble the vases. He makes the flowers and the steams by hand, the buds are made from real money, the leaves are made from porcelain painted and the steams are made from plaster painted and sealed. Once this is done it is time for Martin to put them in place and freeze them in the resin - that is the difficult bit! As well as his resin 3D sculptures, Martin has also created some plaster wall hanging works. Moulded from a number of different currency, they continue his exploration of moneys roll in our lives. These simple pieces work beautifully alongside his larger and more vibrant paintings and offer a moment of quiet in another wise bold and dynamic show. 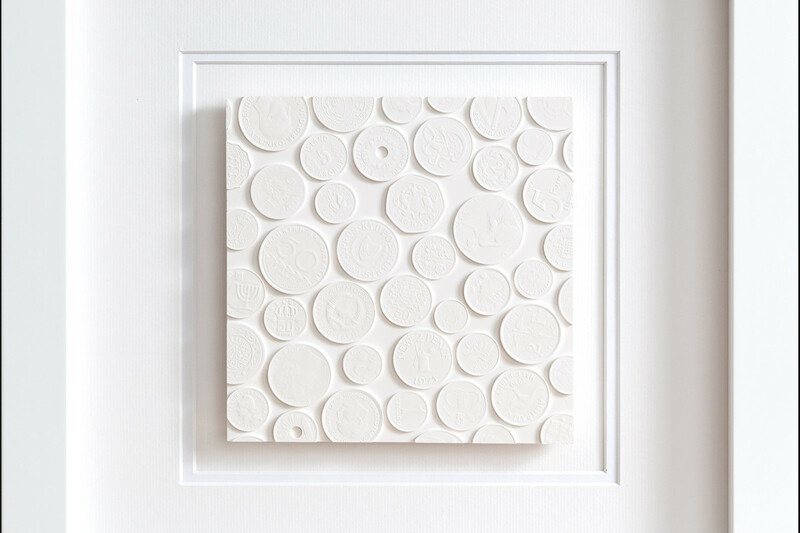 Making these works has also allowed him to further the references he uses in the show - the word love, a crucifix, the USD sign and a love heart are all made from plaster and coins. 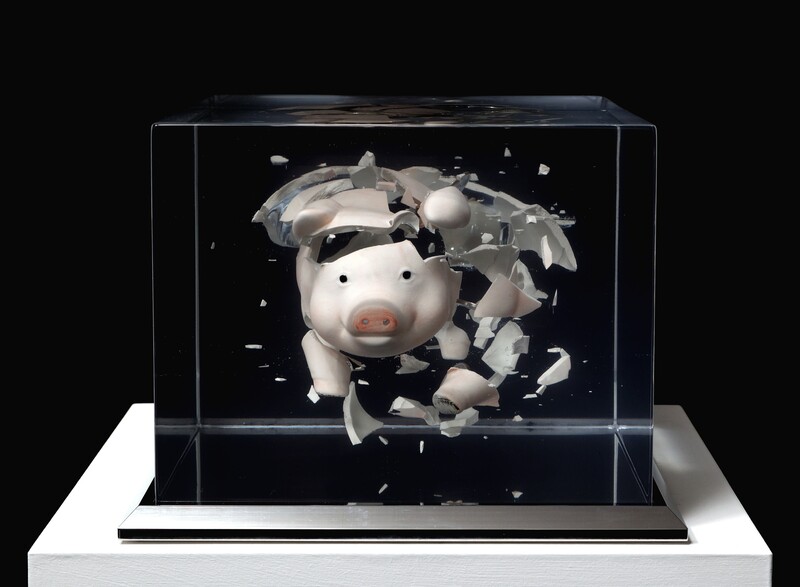 Encouraging the viewer to think about the link between these objects and money – this is reinforced by his choice of titles for the works. They are versatile, they are white and muted and the fact that they reference money is not obvious at first.